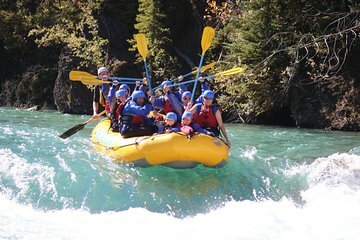 Un recorrido de rafting de 1.5 a 2 horas por el pintoresco río Kananaskis de Canadá, con un baño opcional en el río. Incluye la recogida y recogida en el hotel en Banff o Canmore. Este viaje de rafting es una excelente manera para que las familias y los grupos prueben la emoción del agua blanca. En el camino, disfrutará de los avistamientos de la vida silvestre local y la serena belleza al aire libre del río Kananaskis, un canal de 46 millas que fluye desde las Rocosas hasta el río Bow de Banff. Comience su aventura de rafting con una recogida opcional en Banff o Canmore. Consulte con su operador turístico los horarios exactos de recogida. Luego, disfruta del corto paseo panorámico mientras recorre el campo canadiense. Una vez que llegue, escuche mientras sus guías comparten instrucciones de seguridad y técnicas de remo para su tiempo en el río. Luego salta a bordo para comenzar tu viaje. Esta parte del río discurre tranquilamente, lo que le brinda la oportunidad de admirar el bello entorno forestal y las elevadas montañas que bordean las orillas. Asegúrate de observar la vida silvestre local de la zona, que incluye águilas, osos y ciervos paseando por el camino del río. Justo cuando las cosas parecen estar desacelerándose, el río cobra vida, levantando una serie de rápidos espumosos que harán latir tu corazón. Agárrate bien y escucha las instrucciones de tu guía mientras te ayuda a navegar en aguas bravas. Su día termina con refrigerios, chocolates y transporte de regreso opcional a su hotel. Este es un tour de temporada que se extiende desde mediados de mayo hasta mediados de septiembre, la opción de transporte está disponible desde fines de mayo los lunes, miércoles y viernes. Espere cuatro horas para este tour, o 5,5 horas si se selecciona el transporte. When our family left Banff for the rafting tour on August 2, it was raining and we felt unlucky about the weather. However, when we arrived at the meeting point, the sun came out from the cloud. Actually, we found that the rafting must have been a fun experience regardless of the weather. Our rafting guide was Richard van der Ploeg who was the head guide, leading all the rafting boats. He was very knowledgable and friendly. The wonderful experience with the rafting is largely owing to him. Fantastic experience for our family of 4 2 teenagers. Class 2-3 rapids made for safe but exciting trip down the river. Our guide, Dom, was terrific - knowledgable, friendly, and funny. All of the people working here were great. Recommend this for people looking for an enjoyable afternoon. The whole tour arrangement is a waste of time waiting and waiting. I don't expect having a big group of 100 members in our tour. If i know it's mass tourism, I never join. The tour guide of our boat is totally boring and is someone from Mexico who could speak only fair english. I regret to join this and spend my half day here. The snacks they provide a just cheap crackers and chocolate bucket from supermarket. Viator had this listed as an intimate small group tour but when we arrived there were 120 people doing the rafting trip with us! So disappointing, especially since having a child with anxiety in crowds. It also stated 5 1/2-hour rafting. We had 90 minutes on the water, the rest of the time was spent gearing up 120 people, traveling on a school bus to the location, and getting hot chocolate after getting off the river. If you are looking for a more personal tour - then this is not the one for you. I will say, however, that our guide - Dave - was the only saving grace. Nice guy and very knowledgeable guide. Very organised and they were all great fun, matt was really good fun. I haven't rated it a 5 because the rapids were just a little to tame and there wasn't enough of them. The latter part was a bit boring. It was good if you had young children so maybe I picked the wrong river ! This white water rafting trip is exactly as the web site describes. It is AWESOME!! Suitable for all ages - the staff are extremely well trained, friendly and engaging. Their attention to safety is excellent. Our raft captain was Tim and he is spectacular - fun, interesting and included everyone in conversation. My family highly recommend this trip - and if possible, request to be in Tim's raft!! This was the first family river rafting experience for us and we greatly enjoyed it. The guides were knowledgeable, friendly, courteous and had a great sense of humor. It was safe yet thrilling for us first-timers. Special mention goes out to our guide, Adam, without whom the experience would have been incomplete. Caroline was an awesome Kananaskis River Rafting Adventure tour guide! Marshall our safety instructor was awesome! Informative, knowledgable, witty. He also happened to be our raft's guide. Skilled, friendly, witty. So much fun! One of my bucket list items! Will definitely go with Chinook Rafting again! Fantastic fun. Just what we needed. Safe enough for our 9 year old and challenging enough to keep us all excited. Guides were fun and knowledgable.